Bizzie Bodies are proud suppliers of the UK’s most popular kids climbing frames range, Jungle Gym. Their children’s climbing frames are the ultimate in outdoor activity for your boisterous boys and your adventurous girls. The desire to climb and to explore, to play and to pretend is something which we are all born with. Foster the fascination and wonder in your child as they grow to explore the world around them and take on new, exciting challenges. Let them imagine their own special place to be a fort to be defended from a gruesome dragon, or a palace fit for a beautiful princess, an underground dungeon from which to escape or a lofty mountain peak to conquer; embrace the explorer in your child and marvel at the adventures they create as they play together in the safety of your own garden. 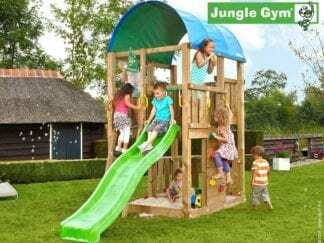 With many different options, there is a Jungle Gym children’s climbing frame to suit your budget. All Jungle Gym children’s climbing frames are made from natural durable materials, with optional safety bumpers. Each of the tower climbing frames comes with an integral ladder, optional roof, a sandbox and a curved slide. 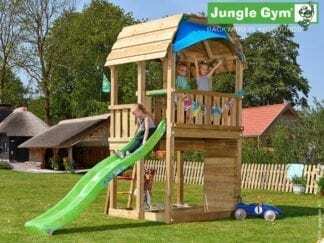 Whether you choose Barn or Mansion, Fort or Palace, you can rest assured that your children will enjoy hours of fun climbing and sliding on the Jungle Gym children’s climbing frame. Each of the climbing frame options is versatile enough to add additional sections as your family grows. This will give them the room to play independently or together and give them the space to develop the necessary skills for social and physical growth and development.